NEW DELHI: Delhi High Court has dismissed a revival scheme filed by Assotech stating that the scheme does not include all the creditors and home buyers of the company and hence must be dismissed. The court has now ordered Assotech to consider all creditors and will hear the case next on July 26. The order comes after a petition was filed by homebuyers of Windsor Court (one of the Assotech projects) through their counsel Ashwarya Sinha and Ajit Kumar Sinha. The case relates to Assotech defaulting on dues to over 30 secured creditors and delaying completion of three residential projects situated in Ghaziabad and Noida by over six years. In 2016, an official liquidator (OL) was appointed to acts as Provisional Liquidator and look into the matter against which senior advocate Vikas Singh, appearing for Assotech, filed an application consisting of a revival scheme. It had proposed to infuse a sum of Rs 5 crore from personal resources of the ex-management of the company as security, proposed to complete the three incomplete projects by March 2020 and sell a commercial building spread across 1200 sq meters in Sector 24, Noida having estimated realisable value of Rs 20 crore. The company claimed that with completion of all projects, a sum of approximately Rs 124 crore is expected to be generated which will be enough to pay all its dues. Singh had appealed for bail or anticipatory bail of the ex-management, stay of all the proceedings against Assotech and discharge of Provisional Liquidator. However, the scheme included only the secured creditors estimated to be above 30 and not the home buyers. Sinha appealed that there is a six year gap in completion of the three projects and the ex-directors cannot be trusted with the present scheme of revival. They also claimed that the directors of the company have sold immovable property belonging to the company while in liquidation. Assotech has about 1100 units in three incomplete projects: The Nest situated in Crossing Republik, Ghaziabad, Celeste situated in Sector-44, Noida and Windsor Court in Sector-78, Noida. 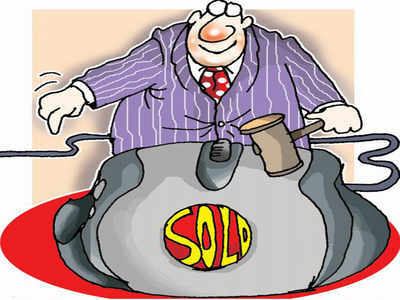 The list of creditors includes ICICI Bank, IDBI, Essel Finance and Religare among others. The dues of ICICI Bank are about Rs 6 crore while outstanding dues to other secured creditors is above Rs 50 crore. NOIDA/GHAZIABAD: On the second day of imposition of the polythene ban ordnance across Uttar Pradesh, Noida, Greater Noida and Ghaziabad officers took to the field to investigate, inform, seize and extract fines from violators. However, city-based traders on Monday expressed, alternatives in the form of accessible cloth, jute and paper bags are the only way for a complete shutdown of plastic usage. In Noida, multiple teams went out for seizing polythene bags and made a haul of 20kgs of polythene bags on Monday. A fine worth Rs16500 was imposed as well. In Greater Noida, awareness drives were conducted in Alpha and Gamma markets. Total plastic seized in the city was 15kgs but no fines were imposed in Greater Noida. The sectors where officers went were sector 6, 27, 19, 50 and 77. The drive is to make Noida completely polythene free. Drives were also executed in the hosiery complex and Raipur village. 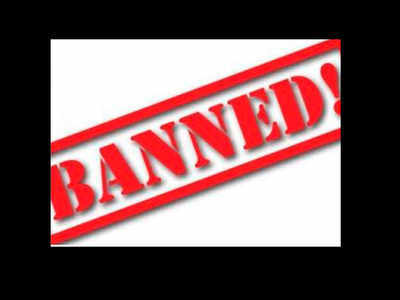 The fines imposed in Uttar Pradesh on June 15 by an ordnance signed by governor Ram Naik, are much lesser than the amounts imposed in Maharashtrafor similar offences where a carpet ban on plastic manufacture and circulation has been imposed recently. Whereas, the UP ordnance has imposed a Rs 1000 fine to begin with, in Maharashtra the same offence is fined at Rs5000 running up to Rs 25,000 for future offences. “We have created a plan for regular drives to extract any stored plastic bags or packages and each day the exercise will be carried out. In Ghaziabad, the polythene ban drive was carried out in Sahibabad mandi, with the support of SDM Sadar, tehsildar, UPPCB and Nagar Nigam officials. A total of 20kg polythene were seized from the drive and Rs 7,000 worth fines were imposed on sellers, confectioners in Shahibabad mandi. “Apart from drives, awareness campaigns have been started at school levels to engage the citizens in giving up usage of plastic totally. The initiative to seize and fine will be carried out regularly until the city is made polythene free,” AK Tiwary, regional officer, UPPCB, Ghaziabad, said. “We held a meeting with representatives of small scale industries as well as traders. We have told them on the need for complete regulation on plastic usage and selling. The details of the ordnance has also been explained. The ordnance permits the government to even imprison violators in case of repeat offence and we are compelled to act to uphold the rules,” city magistrate, Gautam Budh Nagar, Mahender Singh said. “Simply imposing fines is not a solution. To make the ban sustained and permanent, consumers as well as sellers need alternatives. Plastic usage has to be replaced by eco-friendly solutions so that people automatically stop using them,” SK Jain, president, Uttar Pradesh Vyapar Mandal said. “In order to stop the usage of plastic in the state, The ordnance has to be followed strongly. Just as strong steps are being taken to stop circulation, stopping manufacture of plastic in the state has become equally important,” Vikrant Tongad, an environment worker from Greater Noida said. “Multiple teams have been created to bring the plastic ban into force. By October 2, when the third phase is enacted in the state, Gautam Budh Nagar will be completely plastic free,” BN Singh, district magistrate, Gautam Budh Nagar added. NOIDA: Even as the city administration is going all out to implement the polythene ban ordnance, environmental lawyers say a U-turn can’t be ruled out unless the prohibition is sustained by regular police intervention. A ban on plastic usage has been in place in Uttar Pradesh since December 2016, but the reinforcement of the same has failed at least two times till now. Green lawyers feel the state government has a major task in hand to carry out round-the year vigilance to sustain the ban. While a crackdown — as the one is currently in progress — may disrupt the usage of prohibited polythene, but plastic bags could return in four to five months unless the unorganized sector is checked, they say. “There is every chance of such a ban failing within three to five months of its imposition, if police action is not stringent in controlling the unorganised sector where plastic bags are actually manufactured and supplied from. Production of plastic bags is a lucrative business and the manufacturers are not easy to detect since they operate out of informal outfits and sometimes from villages,” Gaurav Bansal, advocate in the National Green Tribunal, told TOI. “If the spirit of sustaining this ban needs be preserved, then the state police has to investigate and inform both the authorities, courts and pollution control board about their manufacture and supplying activities,” he added. 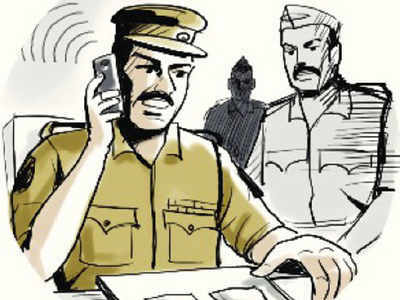 According to Bansal, it is the primary responsibility of the police to keep the administration informed about any unauthorised production taking place in the unorganized sectors. “The reach to such lanes and bylanes where such production takes places can only be accessible to police. Unless they are entrusted to inform, no action can be taken or sustained,” he added. “The reason for which plastic ban has failed at least twice since the imposition of the ban in 2016 is due to a lack of awareness among citizens and lack of supply of either cloth or paper bags to grocery shopowners. As a result of the inconvenience caused and because manufacturing of plastic bags never stopped, plastic bags slowly made a comeback. We are trying to ensure both awareness and regulation this time,” a regional UP Pollution Control Board official said. 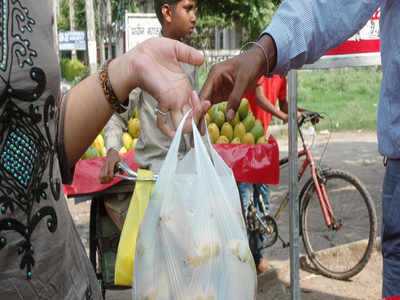 The ordinance for plastic ban in Uttar Pradesh was enacted on July 15, following which enforcement agencies of Noida, Greater Noida and Ghaziabad have been cracking down heavily on the usage and circulation of plastic bags. 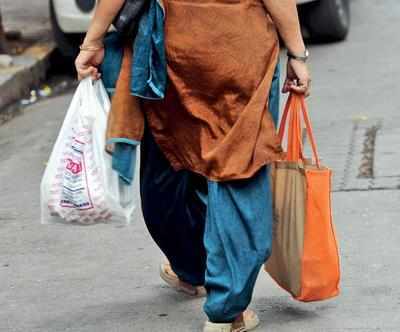 While a number of plastic bags have been seized since Sunday, fines have been imposed on users and godowns have been sealed by the administrations of Gautam Budh Nagar and Ghaziabad. 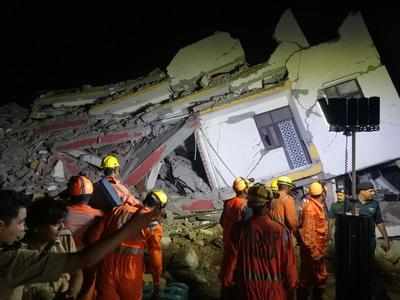 Noida: Two six-storey buildings collapsed in Noida Extension’s Shahberi villagelate on Tuesday, leaving several people trapped under a huge mass of concrete rubble. Rescuers struggled to find a way through several hours into the operation. One of the buildings was under construction and fell on the other, rescuers and local residents said, triggering a collective collapse. Police said some of those buried in the rubble were feared dead. Chief minister Yogi Adityanath has ordered a probe. Earthmovers and a team from the National Disaster Response Force worked frantically at the site but none of those trapped had been found almost three hours into the rescue operations, at the time of writing this report. The site of the collapse is in a remote area, which is connected by a narrow lane. Earthmovers and rescue teams had a difficult time reaching the spot. The exact number of people trapped under the rubble of the buildings, both built illegally, could not be ascertained. The number could be more than 20, based on accounts of residents, who said around 7-8 labourers had set up temporary residence at the building still under construction, while around seven families lived in the other building. At 12.20am, the team spotted a person’s leg under the rubble. They were still trying to reach this person by using an iron cutter to find a way through chunks of concrete that lay between them and the trapped person. Clothes, shoes, furniture and various household items lay scattered. A local resident said a six-storey building had been built illegally two years ago by a developer in which six-seven families had started living on rent. The livelihood of the residents came from employment in local factories. Next to this building, another developer was building a six-storey building in which the construction workers lived. Local residents said after the recent spells of rainfall, water had accumulated on the new building’s foundation and the structure had become weak. Noida Authority officials neither building had any clearance. Vijay Kumar, a local resident, said the newer building had tilted into the older one, triggering the collapse, leaving the people in the buildings under a 30-foot-high mass of debris. Locals informed the police and joined rescue operations. Four earthmovers were also deployed. Arun Kumar Singh, SP (city), said, “It is not clear how exactly this happened. Both the buildings have collapsed and we are trying to rescue the occupants. Some people are feared dead. But we are not clear about the total number of fatalities.” District magistrate B N Singh was also present at the spot. In a statement issued late in the night, real estate body Credai said it was “unfortunate such unauthorised construction is allowed in villages”. 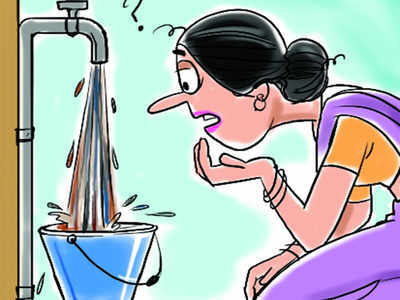 NOIDA: Residents of Sector 51 are complaining of shortage of water supply for the past 15 days with supply only of 45 minutes duration with very low pressure that is insufficient to carry out household chores. While residents of Sector 36 made similar complaints, traders in Savitri market in Sector 18 complained of water logging. However, no action has been taken by the Noida Authority yet. “We are facing water shortage for the past 15 days where very little supply with low pressure is given for only 45 minutes instead of the earlier routine supply from 6 to 9am. We made many requests to Jal division as well as MD Pandey, project engineer, but no solution has been taken out yet. How can residents complete their household chores in mere 45 minutes of supply?” said Sanjeev Kumar, RWA general secretary, Sector 51. Kumar said while the line man of the area maintained shortage of Ganga water supply, he even added shortage was also due to wastage of water at two points in the sector which remain unchecked. While repeated calls and messages to the project engineer remained unattended, sources from the water department revealed that very soon supply of water will be improved. NOIDA: The Noida Authority is planning to auction the top floor of the Sector 18multi-level car parking, which can ideally house a banquet hall or even a coffee shop. “The top floor has 10,000sqm space. The facility is in the middle of the Sector 18 commercial hub. We have decided to float a tender for this purpose. The highest bidder will win the space for commercial use,” he said. 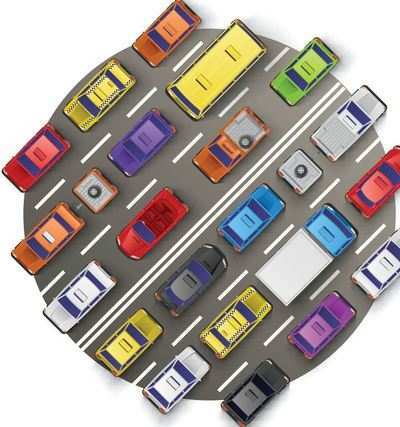 NOIDA: Already delayed by a year-and-a-half, Noida Authority on Tuesday said multi-level parking at Botanical Garden metro station will be ready by January 31 next year. The parking facility having a capacity of 7,000 vehicles is being developed on a 39,000 sq m land adjoining the metro station. Rajeev Tyagi, general manager, Noida Authority, told TOI around 83% civil work of the project has been completed. “Now we have started the electrical work of the project. We hope to complete the same latest by January 31, following which the facility will be opened to public,” he said. The project was commissioned in May 2015 at a cost of Rs 550 crore and it was scheduled for completion in November 2016. The Authority had earlier planned to develop a 23-storey commercial tower with the designated eight-floor parking facility at this site, but the commercial project had been put on hold. 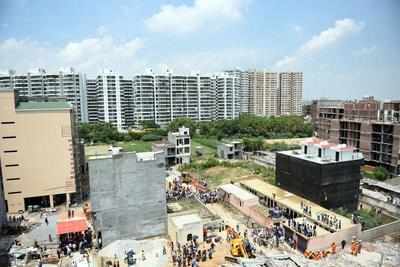 SC Mishra, project engineer, Noida Authority, said the work on the commercial complex will start in the second phase. “The commercial complex is proposed in one portion of the same project site. We have decided to first complete the parking project. In the second phase, we will analyse the commercial market trend and accordingly develop the commercial complex and also seek investment from buyers,” he added. The proposed 70-metre-high building will have commercial use also, including office space and retail shops. The opening of the multi-level parking will drastically improve the traffic situation near the Botanic Garden metro station. At present, only 500 vehicles can be parked in the existing parking lot at the Botanical Garden metro station. Commuters, mostly office-goers who travel to Delhi and Gurgaon, park their vehicles at this station. However, due to space crunch, parking cars often becomes a difficult task. “I sometimes travel to Gurgaon and need to park my car at the Botanic Garden metro station parking. Only when I reach there early in the morning, I find parking space. Otherwise I had to park my car on the roadside,” said Sushil Kumar, a resident of Sector 45. The multi-level parking lot also aims to solve parking issues at Botanical Garden metro station as commuters using Magenta line can also park their vehicles. NOIDA: There are thousands of unregulated buildings in Noida built with the same lack of oversight as the two buildings that collapsed on Tuesday night in Shahberi. This, obviously, didnt happen in a day  across 80 Noida villages, apartment buildings have been coming up steadily over the last couple of decades, offering cheap accommodation and flats for sale. Neither the Noida Authority, nor the district administration stopped this, or formulated a mechanism that would ensure they came under regulatory supervision. Flats in village buildings, in the meantime, found their way into government books with a legal stamp because they were registered without objection, or verification. Its a similar situation in Greater Noida. The pace of real estate development in Noidas villages would be significantly higher, proportionate to how the two cities have developed and metro connectivity. Building in villages is easier because land is freehold as opposed to urban Noida where land is leasehold. So, while the Noida and Greater Noida Authorities focused on group housing projects in developed sectors, the illegal market flourished simultaneously, with a well-oiled system in place of local builders and brokers who facilitated sales and registries. In leasehold properties (group housing societies), the Authority allots land to a developer, which proposes a building plan and submits it. Once approved, the developer hires a contractor who submits an undertaking on quality of material that will be used. Once the project is completed, the Authority inspects it and issues occupancy and completion certificates. In freehold land in villages, the only liaison with the government happens at the point of registry. Its not that there is no law. The development of freehold properties in Noida is governed by the New Okhla Industrial Development Authority (Fourth Amendment) Manual 2016. It says building layouts in rural areas shall be approved by the Noida Authority and that a project must be vetted by competent officials. 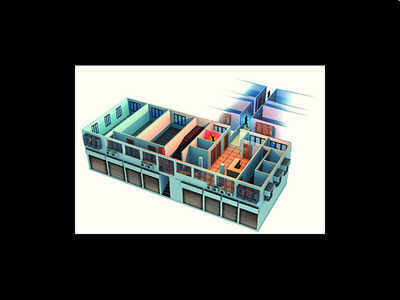 The maximum permissible floor area ratio (FAR) is 1.8 with height of 15 metres (up to 3 floors). Few have conformed to this. Both buildings in Shahberi that collapsed had six storeys. The lack of coordination between the authorities, district administration, registry department has made the job of unscrupulous builders and brokers easier. Noida CEO Alok Tandon said on Thursday people in rural areas can use their freehold land and build homes for personal use. They cant make group housing societies on such land. A prior approval of layout is mandatory. We have also issued a guideline for development of projects in rural areas, Tandon told TOI. Noida is spread across 20,000 hectares and all its urban and rural areas are notified, meaning the land comes under the ambit of the Authority. The stamp and registry department should verify the property documents before registry, said a Noida Authority official. S K Singh, assistant commissioner of the stamp and registry department in Gautam Budh Nagar district, said, We are not entitled to check the project title and quality of construction materials. This is the work of authorities concerned and buyers. The stamp departments primary objective is to ensure there is no stamp duty evasion, he said. District Magistrate B N Singh said the Authority should acknowledge its responsibility of monitoring real estate projects in private and government land alike. The Authority is the custodian of the land and is entitled to check construction. The registry department is just engaged in transferring a property from A to B. They are not entitled to check the papers of properties. He said that Authority has right to approve, disapprove, seal or demolish a property. But the important question, how unregulated buildings can be regulated, found no answers. NOIDA: The Noida Authority on Thursday announced no construction in rural or urban areas can take place in the city without its approval but didn’t say how it planned to regulate buildings in villages, like the ones that collapsed in Shahberi, in future. 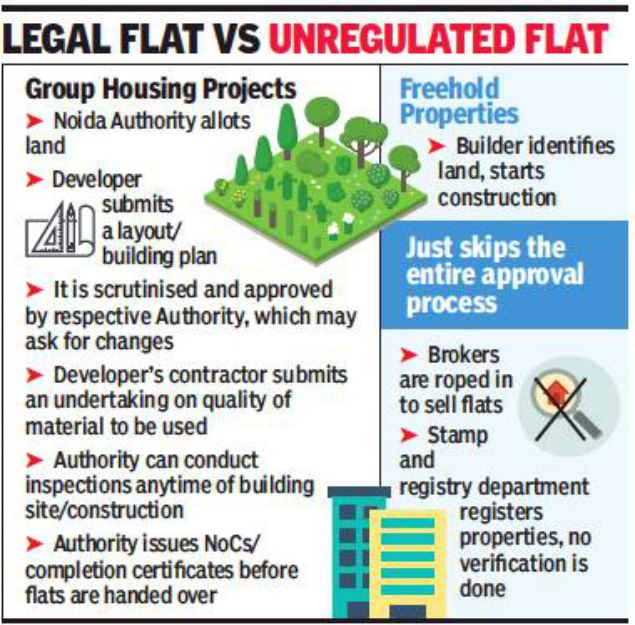 It has always been illegal to build in Noida without the Authority’s approval, so it was merely reiterating that. Noida CEO Alok Tandon said it was mandatory for any developer to get a project’s map approved before starting any construction work. “Only Noida Authority has the right to acquire the earmarked land for planned development. No builder, developer, organisation or society is authorised to launch any developmental project in the notified land without Authority’s permission. They are also not entitled to float booking of such projects before our nod,” said a letter issued by Tandon. The CEO advised people to first check the allotment record of a property they were interested in buying as well as whether the developer has got clearances in line with the New Okhla Industrial Development Authority (Fourth Amendment) Manual 2016. The Noida Authority also directed developers to ensure they publish (in footnote of advertisements) a project’s allotment number, date, layout and location in clear terms. NOIDA: Two days after the two buildings collapsed in Shahberi village, 13persons who allegedly built illegal buildings were booked in Noida for unauthorised constructions of multi-storey buildings on Thursday. The FIR was registered after Noida Authority engineer filed complaints in Sector 20 and Sector 24 police stations. Rajeev Tyagi, general manager, Noida Authority, said a team conducted inspections of illegal structures in Atta Village, Nithari Village and Morna village. NOIDA: The Centre might be working on dream projects like ‘Housing for All by 2022,’ with specific solutions for lower to middle income groups, but the situation on the ground tells a different story with huge gaps between the demand and supply of houses which cost less than Rs 30 lakh. Many lower income buyers who seriously need a house in NCR often risk their investment by buying illegal properties at a time unsold inventory pile up in the organised sector. Though houses that cost less than Rs 30 lakh are available in the organised sector, many feel that the prices need to be pushed down to Rs 15 lakh to make them accessible for those in dire need of them in urban hubs like NCR. “We can’t sell below Rs 24-25 lakh due to the cost a builder has to incur for construction. If we are given adequate subsidies in terms of circle rates, approvals and registration and other costs, we can bring down the prices of affordable houses. It is clear there is a huge demand for cheaper houses and unauthorised colonies like Shahberi are cropping up because of such demand,” Pankaj Bajaj, president, Credai NCR, told TOI. Though the houses in organised sector are not too expensive compared to the rates of apartments in the unorganised and of illegal ones, the lure lies in quick availability of ready apartments, freehold deals and the convenience of cash deals. According to Credai, there are around 7 lakh flats below the price range of Rs 25 lakh in Noida, Greater Noida and Ghaziabad. NOIDA/GHAZIABAD: The district authorities and officials of the UP Pollution Control Board are exploring options to dispose of the 7,000kg of polythene bags and other goods that have been seized over the past five days following the statewide ban on plastic. Officials said more such seizures were expected over the next two months. As of now, Ghaziabad has accounted for a major part of the plastic haul, with three godowns filled with polythene bags sealed. “We will either send the seized plastic to recyclers or to other agencies for converting them to material for construction of roads,” a senior official of the UPPCB said. AK Tiwari, the regional officer of UPPCB, iterated the need for closing down supplying agencies. “The operation has become concentrated. We are trying to crack down on unorganised manufacturers so that we can stop production. The idea is to stop polythene from reaching the market,” he said. The two districts of Gautam Budh Nagar and Ghaziabad have seized 7,000kg of plastic bags in total over the past five days. While Rs 72 lakh has been collected in fines in Ghaziabad, a manufacturing hub, Noida has contributed Rs 2.25 lakh in fines. “The state government will restrict the use of plastic. The alternatives currently are in the form of cloth bags, paper bags and other biodegradable material. Plastic manufacturers have to find it viable to produce eco-friendly material. The ultimate solution will come from the citizens themselves,” said Gautam Budh Nagar city magistrate Mahendra Singh. The UPPCB has also got cracking on polluting factories in Ghaziabad, sealing at least 500 units running illegally between April and June in Loni. Officials said that while regular checks and control on illegal and polluting factories in the district were being conducted regularly, the latest was by far the strictest. The number of factories sealed was mentioned in a report the UPPCB filed to the state government on July 11. The report mentioned that the factories that were sealed had been mostly operating without licence and producing highly polluting products such as paints and denim dye. “These factories had been operating illegally. Over the past three months, we have been able to seal them and cut off power supplies, which, too, they had been sourcing illegally. The data of this entire operation was collated and submitted on July 11,” UPPCB officer Tiwari said. Sources said the UPPCB had shut down 1,500 illegal factories in Ghaziabad over the past one year. FONRWA has proposed to manufacture and distribute 30,000 cloth bags in Noida on August 15. NOIDA: The Federation of Noida Residents Welfare Association (FONRWA) has proposed to manufacture and distribute 30,000 cloth bags in Noida on August 15. It is the first initiative by the RWA body to support plastic ban with a citizen-centric solution. According to RWA members, the cloth bags will be distributed for free for the first time in order to encourage residents to become responsible shoppers and give up dependence on polythene bags. “This is a free service to start a citizen’s initiative in the city. We fully support the ban on plastic usage. This first free distribution of cloth bags will propel the movement forward. Individual RWAs in the city will be encouraged to sustain the drive to further make cloth bags available to the citizens so there is no need for polythene bags at all,” said N P Singh, president, FONRWA. The cloth bags will be made on order and will be distributed on Independence Day in spirit of the day. FONRWA representatives added they plan to engage all their existing members to come up with suggestions on eco-friendly alternatives. 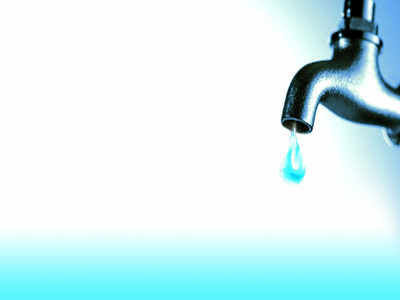 NOIDA: Residents of sectors 27, 28, 29, 30, 36 and 51 complained of acute watershortage for over five days. Some residents had to buy bottles of mineral water for past two days for their daily chores. SC Arora, senior project engineer (Jal) said there was a problem in supply of Ganga water from Ghaziabad which has been resolved now.